Team Sky stars Chris Froome and Geraint Thomas are confident the departure of their sponsor for 2020 will not affect them in the coming season. Sky announced on Wednesday that it will end its partnership with the British outfit at the end of next year, leaving the team without a sponsor for the first time since they were formed in 2010. 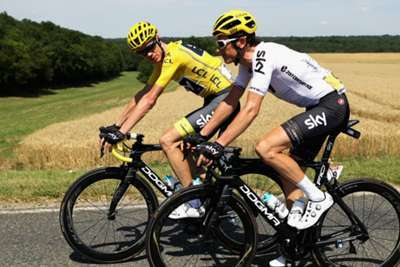 However, neither Froome nor Thomas expect their chances in Grand Tour events in the meantime to be harmed, outlining the motivation of riding to attract a new partner. Six-time Grand Tour winner Froome said: "We've got to remain optimistic and not lose focus on what we've got to do. We've obviously got big goals next year, to win a lot of bike races and for me personally, my target will be on the Tour de France. "I've got every confidence that, if we can have a season next year that's similar to previous seasons, we'll be able to find another sponsor. "I don't think it will affect my chances [in the Tour de France]. Nothing's changing in the team right now. We've got one more year to race and, if anything, it's given us even more motivation to go out and have the best season possible next year." And 2018 Tour de France champion Thomas is taking a similar stance, insisting Team Sky will remain highly motivated in the coming 12 months. "It doesn't affect anything for next year," he said. "I'm not going to worry about the team. "I just stay in my own world, stay in that bubble, and concentrate on being the best that I can for next year. "It's the same as it has been the last nine years for next year, so it doesn't change anything. It just gives everyone a bit more motivation really and galvanises everyone. It keeps the team motivated and really pushing on."